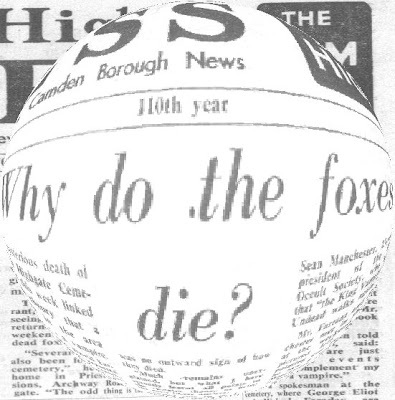 On the morning of 27 February 1970 a banner headline across the newspapers — "Does A Wampyr Walk In Highgate?" — quickly followed by appearances on television and in a host of periodicals made Bishop Seán Manchester a household name where the Highgate Vampire case was concerned. For more than forty years he gave interviews and contributed to countless film documentaries about his mysterious investigations that lasted from the 1960s to the 1980s until the case was finally closed and its files archived. Now Bishop Seán Manchester has given his final interview on the matter. He spoke for over two hours as three cameras recorded the historic occasion for posterity on the forty-first anniversary of the time he first brought to public attention the existence of a contagion at Highgate Cemetery. The Hampstead & Highgate Express, 27 February 1970, filled its front page with his startling revelations, albeit misquoting him and misrepresenting another exorcist, Reverend Christopher Neil-Smith, in their article written by editor Gerald Isaaman. Since then the bishop has contributed to literally hundreds of interviews and television documentaries about his mysterious investigations spanning a period of no less than thirteen years. Now he feels that everything there is to say about the case has been said. He finds himself answering the same questions he was being asked four decades ago, and while Bishop Manchester fully understands the enduring fascination the case holds ─ he wrote his book about his experiences to satisfy this need ─ the time has now come to draw a line under the topic. He had informed the public on 27 February 1970 that demonic disturbances and manifestations in the vicinity of Highgate Cemetery were vampiric. Shortly afterwards he appeared on television on 13 March 1970 to repeat his theory. The suspected tomb was located and an exorcism performed in August 1970. This proved ineffective as the hauntings and animal deaths continued. Indeed, they multiplied. All manner of people were by now jumping on the bandwagon; including film-makers, rock musicians and sundry publicity-seekers. Most were frightened off. Some who interloped became fascinated by the black arts with disastrous consequences. In the meantime, Bishop Manchester and his colleagues pursued the principal source of the contagion at Highgate until it was properly exorcised in the correct manner in 1974. The nightmare journey, however, continued for another eight years, witnessing the bishop entering further into a nether region inhabited by terrifying corporeal manifestations. 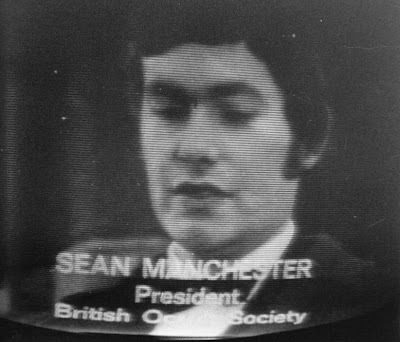 “Seán Manchester’s Vampire Research Society grew out of his previous leadership role in an occult investigation bureau. The society investigates all aspects of ‘supernatural vampire phenomena,’ a task that has led to a variety of research projects, including the famous Highgate Vampire.” — J Gordon Melton, chronicler of vampire topics, Santa Barbara, USA. 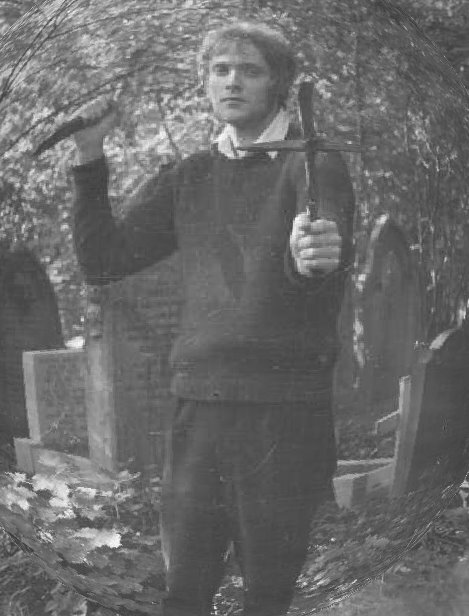 The mass vampire hunt at Highgate Cemetery on 13 March 1970, following reports in local and national newspapers, plus a television interview with various witnesses earlier that evening on British television, led to a spate of amateur vampire hunters inflicting themselves on Highgate Cemetery with home-made stakes, crosses, garlic, holy water, but very little knowledge about how to deal with the suspected undead if they encountered it. Bishop Manchester had made an appeal on the Today programme at 6.00pm to request the public not to get involved, nor put into jeopardy the investigation already in progress. Not everyone heeded his words. Over the following months a wide variety of independent vampire hunters descended on the graveyard — only to be frightened off by its eerie atmosphere and what they believed might have been the vampire. Some were quickly arrested by police patrolling the area. The public were advised that a full-scale investigation was taking place. Individual efforts by those merely seeking thrills, however, served only to endanger all concerned and frustrate the official hunt. Simon Wiles and John White armed themselves with a crucifix and a sharpened stake, and set off to see if they could locate the vampire’s tomb. Like others who followed in their wake, they were arrested by police who found their rucksack and its contents: an eight inch long wooden stake, sharpened to a point. Mr White later explained at Clerkenwell Court: “Legend has it that if one meets a vampire, one drives a stake through its heart.” He was wearing a crucifix round his neck and Mr Wiles had one in his pocket. They were eventually discharged. Thus began a trend. A 25-year-old history teacher from Billericay, Alan Blood, also descended on Highgate after seeing the Today report, but he, at least, had the good sense not to enter the infamous graveyard. 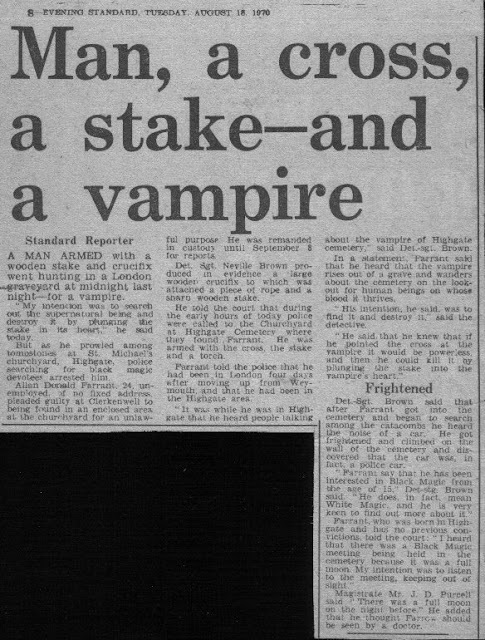 Though described by the Evening News, 14 March 1970, as a “vampire expert,” Mr Blood, in a later interview given to the Hampstead and Highgate Express, 20 March 1970, admitted that he was no such thing. “I have taken an interest in the black arts since boyhood, but I’m by no means an expert on vampires,” he told them. Following a drink in the local pub, Alan Blood joined a crowd of onlookers outside the cemetery’s north gate, but he did not enter. Police searching the cemetery arrested the amateur vampire hunter five months later. He was found to be in possession of a wooden stake and a crucifix. Charged with being in an enclosed area for an unlawful purpose, he was later released because, in the strict sense of the wording, Highgate Cemetery is not an enclosed area. The lone intruder had made his television debut five months earlier, employing on that occasion the name on his birth certificate. Now he adopted a pseudonym which appeared in many (but not all) of the newspaper reports covering his arrest and court appearance. When the American vampire aficionado Donald F Glut came to write his book True Vampires of History (1971) he referred only to "Allan Farrow who was arrested for trespassing in a London Graveyard." 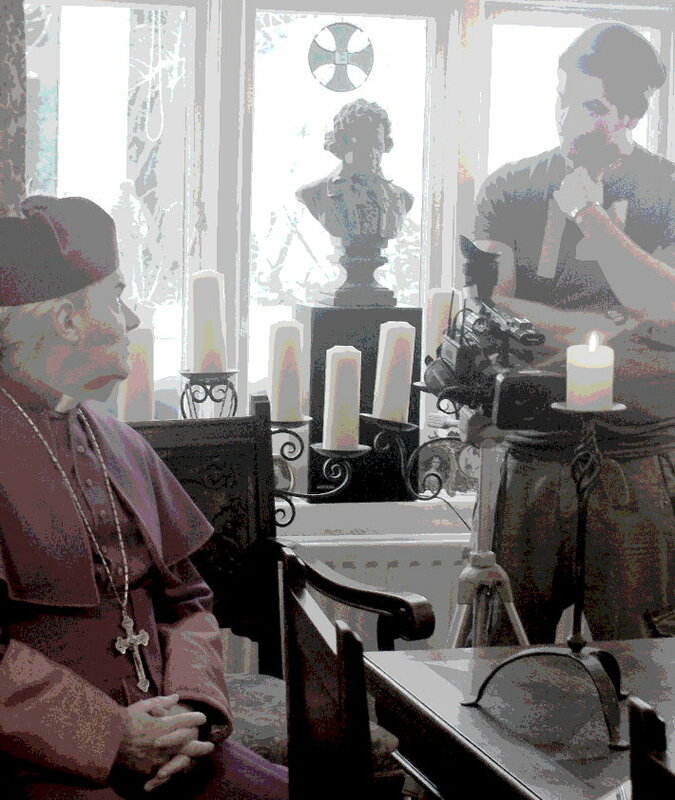 Kev Demant jumped the gun by two decades with his "Last Highgate Vampire Interview" in Udolpho magazine. He conducted his interview with Bishop Seán Manchester, who was gradually persuaded and hesitatingly consented, in writing. The bishop's schedule prevented a face to face interview, which obliged Mr Demant to ask questions on the magazine editor’s behalf via correspondence and the bishop answering them through the same medium. The final interview would actually take place many years later in the following century. Bishop Seán Manchester, an opponent of the suffocating influence of modernism and the dictatorial liberal elite in both secular and ecclesial life, will continue to make broadcast contributions where it is in the public interest or where an opportunity to address an injustice arises. He will not, however, be willing to contribute any further media interviews about the Highgate Vampire case he investigated from 1969 to 1982. His final interview was transmitted at 8.00pm Pacific Time / 11.00pm Eastern Time on The Conspiracy Show (Vision TV, Canada) on 1 April 20011. 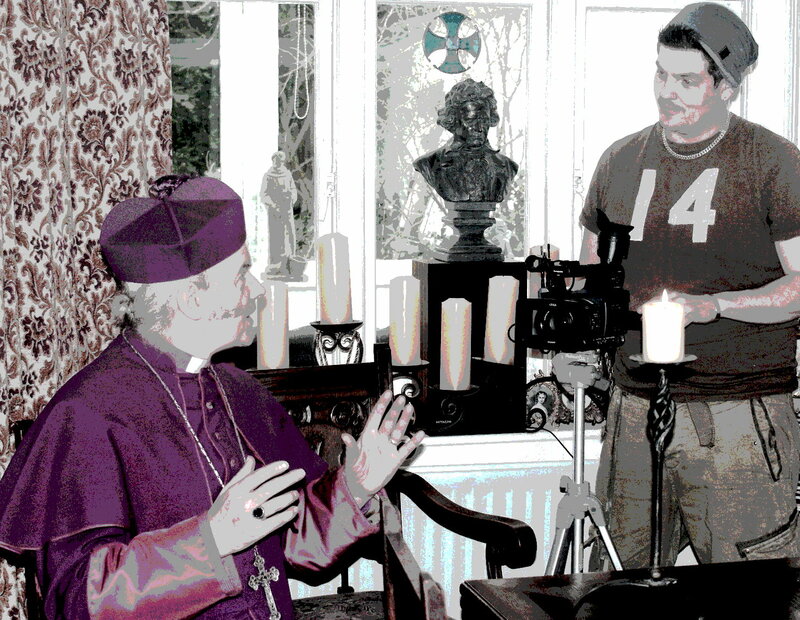 Also included in the programme were paranormal commentators Rosemary Ellen Guiley, Joe Nickell and Neil Arnold. 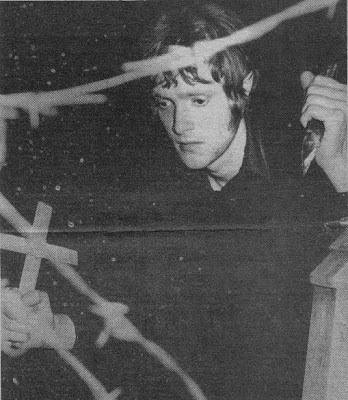 David Farrant vampire hunting in August 1970. David Farrant recently gave an interview to Pat Bussard for a publication called The Loafer, 14 September 2010, where he offered the following about his alleged experience at Highgate Cemetery more than forty years ago: "I saw this entity myself one night in late December, 1969, as I was passing the top gate of Highgate Cemetery. I wrote about this to the local paper, and several other people wrote in with their own experiences, but then rumour went around that it was really a blood-sucking vampire, and serious vandalism and desecration increased in the cemetery, apparently from would-be Van Helsings." In fact, there was no increase in vandalism following the media's preoccupation with the vampire theory which, incidentally, had been around since the mid-1960s. Due to all the attention the graveyard received from 1970 it was no longer possible for vandals and diabolists to enter and leave the graveyard with the ease they had hithertofore, and vandalism actually sharply decreased as a consequence. That notwithstanding, Mr Farrant was convicted of vandalism and desecration at Highgate Cemetery less than a handful of years after his supposed ghostly encounter for which a stiff prison sentence was meted out. At least two names and addresses (belonging to Audrey Connely and Kenny Frewin) and one further address (belonging to Nava Grunberg) with a false name and not the occupier's name (in Hampstead Lane) were used by Mr Farrant to send fraudulent letters to the editor of the Hampstead & Highgate Express in the wake of his own published correspondence. Ironically, Mr Farrant refers to himself as becoming "reduced to some modern-day Van Helsing-type vampire hunter" at the end of his account (on page 21) more than two decades after the event itself in a self-published exploitation pamphlet titled Beyond the Highgate Vampire. "Some nights I walk home past the gates of Highgate Cemetery. "On three occasions I have seen what appeared to be a ghost-like figure inside the gates at the top of Swains Lane. The first occasion was on Christmas Eve. I saw a grey figure for a few seconds before it disappeared into the darkness. The second sighting, a week later, was also brief. "Last week the figure appeared, only a few yards inside the gates. This time it was there long enough for me to see it much more clearly, and now I can think of no other explanation than this apparition being supernatural. "I have no knowledge in this field and I would be interested to hear if any other readers have seen anything of this nature." But Mr Farrant was not being "quoted" in the Hampstead & Highgate Express newspaper. His letter to the editor had been published in full, completely unaltered, as Gerald Isaaman will attest to this day. In any case, is it really plausible that Mr Farrant's letter would be manipulated by the editor of a highly respectable newspaper to mean something quite different to that he had actually written? Is it not likely that Mr Farrant would insist on having such a tampered version corrected in the following week's issue if this had really happened? There is no record of him having asked for any such correction. There is no record of an amendment appearing even though his contact with that newspaper remained ongoing for the next few weeks. There are records of Mr Farrant sticking with his personal "three sightings" account until October of that year when it suddenly reduced to "two sightings." All these years later it has become "one sighting." Is it only a matter of time before it is "no sighting"? "Some nights I walk home past the gates of Highgate Cemetery." At that time, Mr Farrant was residing at 294 Archway Road, London. Anyone who knows the general area will be aware that to walk home to that address from any of the pubs in Highgate Village (Mr Farrant drank most nights in the Prince of Wales) could not possibly take you "past the gates of Highgate Cemetery" because the graveyard is in the opposite direction. So David Farrant, after drinking all night, apparently walked home by taking the longest possible route that would create a detour miles out of his way, instead of just nipping down in the opposite direction to where he was residing in nearby Archway Road just ten or fifteen minutes' away? He obviously had not thought his story through before sending it in for publication. The next month Mr Farrant stated to Today interviewer Sandra Harris on British television: "The last time I actually saw its face." Does this not suggest there was a time previous to the one he is referring to in that interview? The description by Mr Farrant in this interview bears no resemblance to his description decades later where the corpse-like figure had transformed into an ectoplasmic mist with red eyes. No mention of "red eyes" was made by Mr Farrant when he was interviewed in 1970. And certainly no mist. However, in the interim Bishop Seán Manchester's bestselling book The Highgate Vampire had been published where a shape-shifting mist with red eyes is described. Draw your own conclusions. Mr Farrant also revised his account of a walking corpse (which he described to Sandra Harris as being "evil") to ley line activity coupled with a mist with two red eyes when pressed to explain his experiences of 1969/1970 in much later years. On 20 April 1996, David Farrant told a Fortean Times UnConvention audience that he did not believe in the existence of evil. On the Michael Cole Show, 20 December 1998, he stated that he did not believe in vampires or the existence of the Devil. In his many self-published pamphlets he claims that he has never believed in traditional vampires and, moreover, certainly did not engage in hunting a vampire in 1970. Mr Farrant's interview ends at this point. David Farrant was acquitted of the charge that had led to his arrest, it being that he was found in an enclosed area for an unlawful purpose. Highgate Cemetery is obviously not “an enclosed area” and that is all he was charged with in August 1970. Three things are of significance in that BBC television interview from 1970. David Farrant reconstructing his vampire hunt for the BBC. 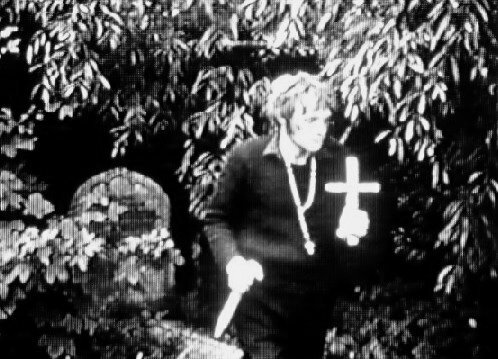 The first is that the reconstructed footage of what David Farrant was doing on the night of 17 August 1970 clearly reveals him to be hunting a vampire with a rosary around his neck, a large cross in one hand and a sharpened wooden stake in the other hand. There is no ambiguity about what led to his arrest in this report where he is featured reconstructing what he was doing at the time of his arrest at midnight in Highgate Cemetery. The image above is taken from the 24 Hours programme as Mr Farrant reconstructs the actions which led to his arrest. The second thing of significance is that when Laurence Picethly asked whether Mr Farrant had ever seen the vampire, he dis not attempt to correct the person interviewing him by saying it was something other than a vampire. Nor did Mr Farrant make clear that he did not believe in vampires, or that what he witnessed was not a vampire. Indeed, this section of 24 Hours was titled Vampires. The third thing of significance is that when asked if he had seen the vampire, Mr Farrant responded: “I have seen it, yes. I saw it last February, and saw it on two occasions.” He can be heard saying that he had two sightings of the vampire in early 1970, but in the interview he gave Andrew Gough for Arcadia he states that he had only one sighting and this was in December 1969, not February 1970 as claimed by him in his BBC television appearance some four decades earlier. He makes the same claim in other latter-day interviews he gives, ie it was only one sighting he had back in December 1969, and that he had no other sightings. The Ghost Club Society is the world's oldest and most prestigious society devoted to the serious and impartial investigation, study and discussion of subjects not yet fully understood or accepted by science. The current president is Peter Underwood, pictured above, who is also a Life-Member of the VRS. 1851 ~ The Ghost Club Society founded in Cambridge. Members include E W Benson, later Archbishop of Canterbury and Arthur Balfour, later Prime Minister. 1862 ~ The London Ghost Club. Members include the Hon A Gordon, Lieutenant-Governor of New Brunswick: a Canon of Westminster and the Registrar of Cambridge University. 1882-1936 ~ First revival. Members include Sir William Crookes, Sir William Barratt, Sir Arthur Conan Doyle, Sir Oliver Lodge, W B Yeats and Harry Price. 1938-1947 ~ Second revival with Harry Price as Chairman. Members include Lord Amwell, Algernon Blackwood, Mrs K M (Mollie Goldney, Sir Ernest Jelf, K E Shelley QC, Sir Osbert Sitwell, Dr Paul Tabori and Peter Underwood FRSA. 1954-1993 ~ Third revival with Peter Underwood as President. Members include K E Shelley QC, Dr Christabel Nicholson, Dr Paul Tabori, Donald Campbell MBE, Peter Sellers, Dennis Wheatley, Dr George Owen, Lord Dowding, Ena Twigg and Sir Julian Huxley. Honorary Life Members include Dennis Bardens, Mrs Michael Bentine, Colonel John Blashord-Snell, Miss Sarah Miles, Miss Jilly Cooper, Dr A R G Owen, Miss Dulcie Gray, Sir Patrick Moore, Mr Uri Geller, and the Right Reverend Seán Manchester OSG. Peter Underwood is Life President and Colin Wilson is vice-President of the Ghost Club Society. At times there was membership cross-fertilisation between the British Occult Society and the Ghost Club Society. In 1988 the British Occult Society was formally dissolved under the leadership of its final president, Bishop Seán Manchester, who had been elected on 21 June 1967. The British Occult Society was originally formed as an umbrella organisation circa 1860. Much of its activity in the late nineteenth and early twentieth century is shrouded in mystery. The BOS came out of the closet, however, in the mid-twentieth century before finally disappearing in 1988. 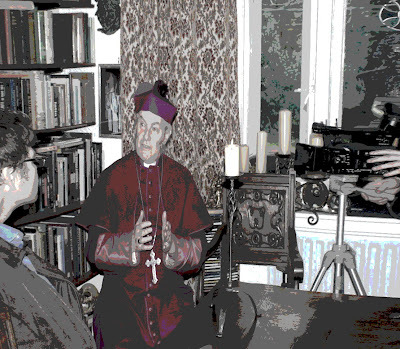 During that period it was presided over by Bishop Seán Manchester who placed emphasis on investigating the claims of the occult and the study and research of paranormal phenomena. 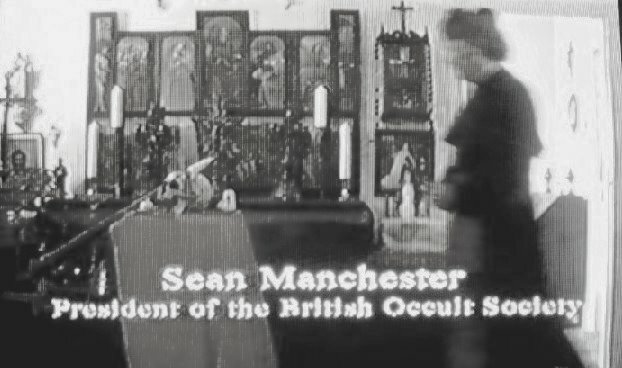 Out of this history sprang the Vampire Research Society, founded by the president of the British Occult Society who first appeared on British television on 13 March 1970, as seen in the above photograph from the original transmission. On this the forty-first anniversary of its founding, the Vampire Research Society is functioning as effectively today as ever it did in years past. In 1990 it was decided by the Executive Committee that membership of the Vampire Research Society should only be available via invitation, usually upon the recommendation of an existing member who has a proven track record. It had never been a subscription club of any sort prior to this, and the majority of those "joining" at the close of the 1980s were patently unsuitable. Moreover, the "invitation only" rule was introduced due to a clear compromise to the Society's security by the media and certain others with, to quote Bishop Manchester, "motives hidden in the darkness of the absurd." The Vampire Research Society actually originated in 1967 as a specialist unit within the British Occult Society (an organisation for paranormal and occult investigation). 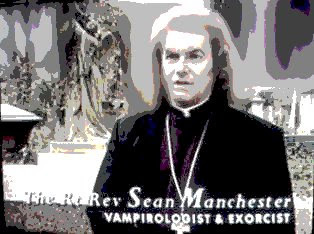 Bishop Seán Manchester was responsible for the vampire research unit becoming a self-governing body on 2 February 1970 by which time he had already initiated, as president of the British Occult Society, a full-time investigation into the Highgate Vampire case. It would last thirteen years. The first published account of the case (including the initial discovery of the suspect tomb and a spoken exorcism) was given in The Vampire’s Bedside Companion* (Leslie Frewin, 1975; Coronet Books, 1976). The first complete account was published in the best-selling The Highgate Vampire (British Occult Society, 1985; Gothic Press, 1991). The current Gothic Press edition is completely revised, enlarged and updated with new illustrations. Final comment on the Highgate case in print appeared in The Vampire Hunter’s Handbook (Gothic Press, 1997) while Carmel ~ A Vampire Tale (Gothic Press, 2000) draws on real experience based on the mysterious happenings in and around Highgate Cemetery. These works contain photographs and graphics from the Vampire Research Society's case files. The purpose of the Vampire Research Society is implicit in its name. Sadly, it is found necessary today to distinguish the dictionary and folkloric definition of the word "vampire" from curious individuals who seek to emulate what they construe vampires to be, but who are clearly human beings merely pretending to be vampires. The vampire, in truth, is a supernatural entity, which traditional understanding of the accepted meaning of the word "vampire" the Society studies, researches and occasionally investigates. People who consider themselves part of a "vampire subculture" are generally referred to as vampiroids. Many lessons have been learned by the VRS over the decades, most particularly the importance of avoiding all involvement with the media and kindred forms of publicity in advance of any given case's resolution. 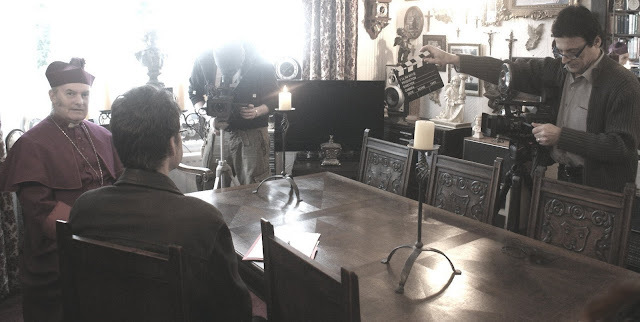 An example of this is the case of the Kirklees mystery where matters were taken out of the Vampire Research Society's hands by others in 1989 when reports of the ensuing investigation started to appear in local and national newspapers and even on some television and radio programmes. The Society could hardly deny that an investigation was in progress, but this certainly put it at odds with the owner of the suspect area which is on private land. Relations have healed during the intervening period and these mysterious investigations remains on the Society's casefile. But they will not be discussed beyond what was published in the previous decade unless the case is satisfactorily resolved and the file permanently closed. The supernatural vampire of folklore as defined in dictionaries, encyclopedias and non-fiction works is the matter of the Society's research and pursuit. To the Christian, Jew, Muslim and those of some other faiths (possibly the Hindu), the vampire is defined as a predatory demonic entity or wraith. To others it might be seen as a parasitic negative force. * The Vampire’s Bedside Companion is out of print. Remaining titles are available and can be ordered directly from Gothic Press.